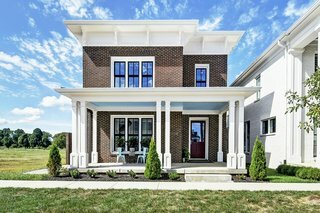 Located in Louisville, Kentucky—home of the Kentucky Derby, world-famous Bourbon distilleries, and recently recognized by Forbes magazine as the second-best housing market in the nation—this noteworthy, three-story green home just hit the market. Designed by Sy Safi, an international award-winning sustainability consultant and progressive builder, the 3,700-square-foot home known as Su Verde features three bedrooms, two-and-a-half baths, three rooftop terraces, and three outdoor patios which make up an additional 2,000 square feet of usable outdoor space. 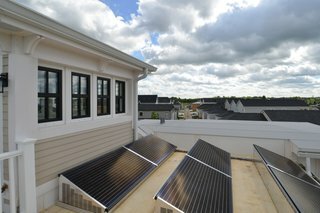 Priority was put on the home’s environmental friendliness, and Su Verde was constructed in compliance with an impressive list of many of the gold standards for health, wellness, and green building: LEED, Passive House, Living Building Challenge, WELL Building Standard, and DOE’s Zero Energy Ready Home. As a result, the home has an average utility bill of only approximately $13 per month. The bright and airy open floor plan features hardwood floors that are made from reclaimed wood from Kentucky horse farm fences. 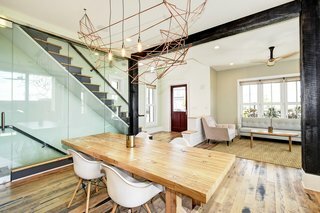 Shown is a reclaimed wood dining room table by Rework Collective and a biophilic chandelier from Honest Home by local Artist Leah Naomi. Thoughtfully designed to ensure that every inch is efficiently utilized, Su Verde boasts beautiful, top-of-the-line modern finishes and technology throughout. The triple-pane, tilt-turn European windows and doors imported from Germany are both functional and elegant. There is a whole-house water filtration system as well as a whole-house HEPA-filtered fresh air system—ensuring an allergen-free living space. Reclaimed barn wood columns and beams treated with the shou sugi ban technique function to define the dining room and living/foyer spaces. An architectural glass wall creates a view of the floating staircase. 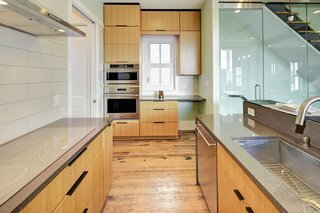 Locally sourced reclaimed wood from Kentucky horse farm fences is repurposed as hardwood floors throughout the home, and reclaimed wood from local barns is used for the built-ins—all complete with non-toxic materials and finishes. 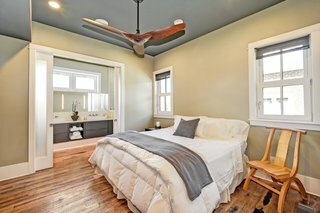 Safi also looked to local companies and makers to outfit the home, with a chandelier from local artist Leah Naomi hanging in the dining room, ceiling fans from Haiku Homes. Locally made Monogram appliances, tiles, and countertops made from repurposed materials are used in the kitchen. The kitchen island picks up on the same shou sugi ban, reclaimed wood as the top of the bar which waterfalls down the sides. 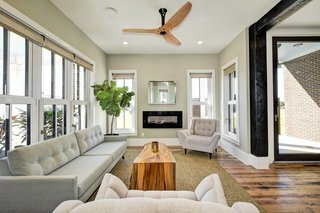 Windows and natural light surround the living room with a locally made Haiku Home ceiling fan. In keeping with the home’s bright and airy contemporary feel, an open-plan layout was used for the first floor, with an architectural wall of glass further opening up the space and allowing a view of the floating staircase. 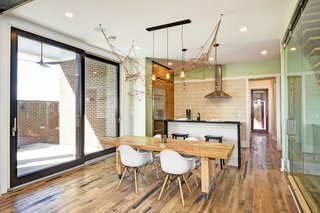 Bold design elements such as the use of shou sugi ban beams as a room divider and the bar top for the kitchen island add texture and character to the home. The kitchen island overlooks the dining, living, and foyer spaces. The open plan makes for easy entertaining and everyday use. The sleek modern kitchen is compact, but has floor-to-ceiling storage cabinets neatly tucked away on either side providing ample storage. 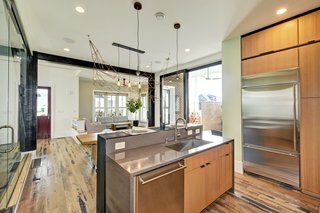 Locally made features include Monogram appliances, the porcelain tile, repurposed countertops, and FSC-certified, toxin-free custom cabinetry. An added highlight is the 1,300-square-foot unfinished lower level. A bonus space comes complete with its own entrance and is framed for its own private bedroom, bath, living area, plus a small kitchen. This flexible additional space could easily be converted into a rental apartment or used as a guest suite. The cozy bedroom features built-in, noise-cancelling acoustics for a peaceful rest. 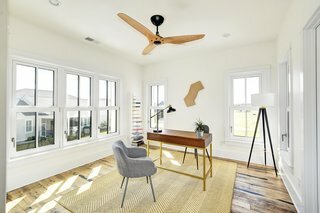 One of the bright and airy bedrooms, currently used as an office space, features a Haiku Home ceiling fan. "Building a typical home was never an option," says Safi. "I envision design that goes beyond architecture and engineering and that addresses the challenges we face with health and wellness, comfort, energy, and our environment. 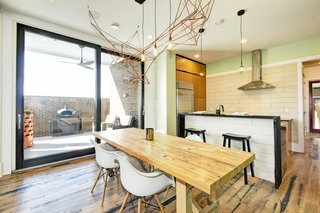 Su Verde is a model example of a high-performance, healthy home that connects function and design for living and thriving." 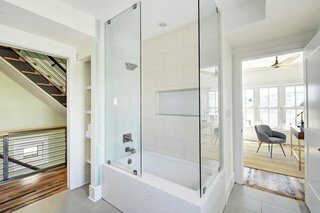 The second-floor bath is spacious and filled with natural light. It also benefits from dual-access entries to both the hallway and the adjacent bedroom. 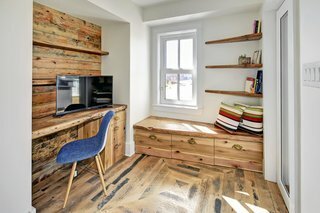 This office space also boasts reclaimed barn wood and features a built-in desk and storage tucked away under the built-in bench. Reclaimed barn wood planter boxes on the second-floor rooftop terrace feature built-in benches and recycled rubber roof pavers. 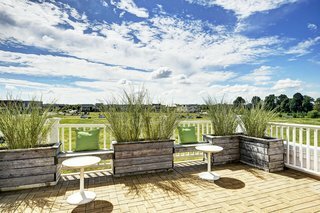 The third-floor rooftop terrace provides beautiful unobstructed views of nature and the surroundings. An optimally designed solar panel array brings the home from a low-energy use home to a zero-energy home. Environmentally-friendly design is packed into every inch of this Modern-Italianate home. Su Verde by Sy Safi 11018 Mayapple St is now being offered at $899,000 by James Peterworth of Kentucky Select Properties in partnership with Alexandre LiMandri of Urban Residential Brokerage. Email info@urbandwelling.life or call 213-447-4080 for more information or to schedule a viewing.